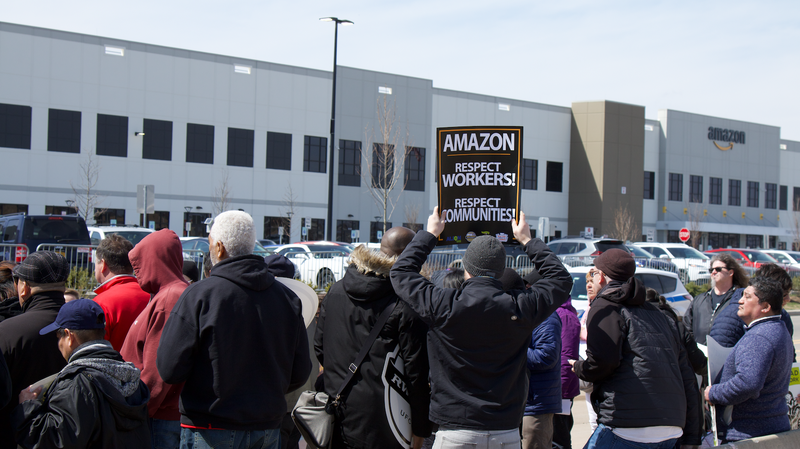 STATEN ISLAND, NY— Organized labor took their fight to Amazon’s doorstep this afternoon, where a crowd of around 100 union members and community organizers gathered in Matrix Global Logistics Park, the site of fulfillment center JFK8 and former place of employment for Justin Rashad Long. The heavily roboticized Staten Island fulfillment center has been a flashpoint for activists since the Retail Wholesale and Department Store Union announced it would be helping workers unionize JFK8 in December. Long, one of the most outspoken workers employed at the center, was fired in February in what he and labor leaders believe was retaliation for his testimony about conditions within the facility. “They talk to you like you’re nothing — all they care about is their numbers,” Long told Bloomberg last year, in testimony that would later be echoed by others employed at JFK8. In an email sent to Gizmodo, Amazon categorically denied allegations of unsafe workplaces in its logistics chain. The company has, nonetheless, developed a reputation, bolstered by stories of frequent 911 calls, exploding bear repellant, extreme heat, and fatalities. Supporting Long were several groups that have been mainstays of anti-Amazon sentiment in recent months, including Make the Road, New York Communities for Change, as well as the Amalgamated Transit Union, Communication Workers of America, the relatively new Staten Island chapter of the Democratic Socialists of America, and the New York State Nurses Association, which recently authorized a strike to demand more reasonable staff-to-patient ratios. Coalition leaders drafted a letter to Amazon—which has been cosigned, among others, by US Representative Max Rose and NY State Senator Diane Savino—demanding Long be reinstated at his job with back pay, and intended to read and hand-deliver it to JFK8 management. Instead, Amazon dispatched what appeared to a junior staffer who declined to give his name or position before ferrying the letter back inside. Police asked the coalition members—who booed—to clear off Amazon property as soon as it had been delivered. One Amazon worker on break remarked “we don’t want a union. How about that?” while another politely asked for a copy of the letter and folded it into his jacket pocket. Rashad and his co-workers and former co-workers spoke out against the backdrop of multiple press stories from around the globe raising serious concerns about health and safety issues in the Amazon distribution network. We are deeply concerned by reports revealing record numbers of 911 calls from Amazon facilities, workers hospitalized in the Intensive Care Unit after a robot punctured bear spray canisters in New Jersey, and workers having such little break time that they were forced to urinate in bottles. An Unfair Labor Practice charge filed by the Retail, Wholesale and Department Store Union (RWDSU) on Rashad’s behalf, states that he was let go on the very day that Amazon announced they were backing out of their plans to build a massive “HQ2” campus in New York City. We are deeply concerned that by firing Rashad, Amazon engaged in an effort to silence him and other workers from exercising their legal right to speak up about working conditions at Amazon. As Staten Island residents, faith leaders, community organizations, labor unions and elected officials we are deeply concerned by Rashad’s firing and by Amazon’s apparent disrespect for its workers. We demand that Amazon respect our community by reinstating Rashad immediately with back pay and committing to respect workers’ rights to organize and speak out for a better workplace.